Alastair Cook looked in good order. If you'd just turned up today and hadn't been on the planet for the last week, you would be very surprised that here was a batsman who is giving it all in and saying that he couldn't do it anymore. He looked like he could seriously do it. But I'm afraid with these things you don't judge it on just one day, one innings, it's a cumulative thing over years and months. I think everyone knew that he could still do it, Alastair knew that he could still do it, the real question is: does he want to do it? How much does it take it out of him to produce an innings like he did today? 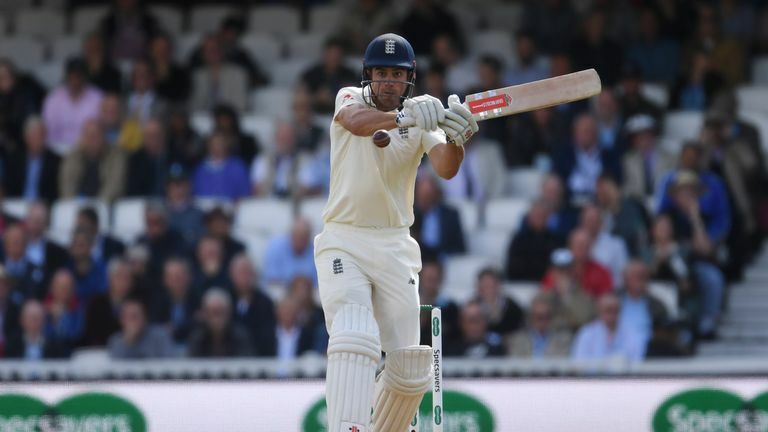 He looked very comfortable at the crease and India, especially after lunch, bowled brilliantly at him and Moeen Ali but Cook looked in good order. It was a typical Alastair Cook innings. We showed some graphics of where he scores his runs, he plays the square cut, they get bored of bowling out there to him so they bowl a bit straighter and he clips it away. Then when they bowled in that area just outside off, bringing him forward, he struggled occasionally. He was dropped by Ajinkya Rahane fairly early on and usually he makes sides pay for that. But he looked composed, sometimes Alastair bats at that tempo and he looks all over the place but not today. He looked very much in control and it came as a bit of a surprise when he did get out. For someone like me, when I was playing in my last game, I was just pleased to get off the mark! 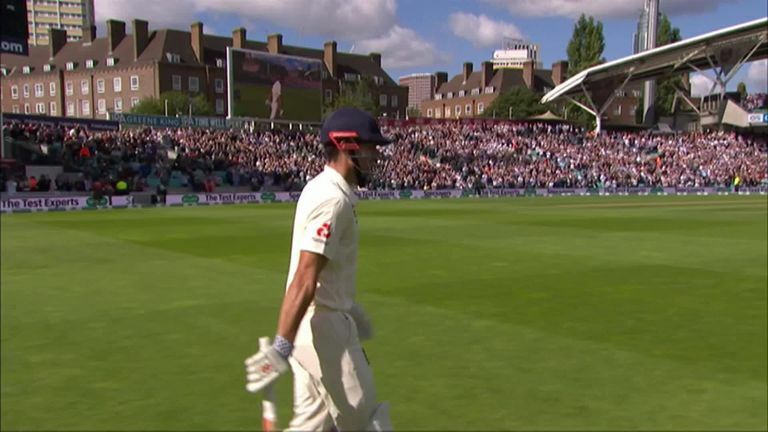 The pressure he must have been under after being given a guard of honour, shaking Virat Kohli's hand - you're under a huge amount of pressure and you don't want to get a first ball duck after that! For the mere mortal it would just have been a case of getting off the mark and getting a score, but once he got past 20, Alastair only had one thing on his mind. He's still got a second innings to get that perfect symmetry that we've talked about, starting and finishing with a hundred against India and going to 33 hundreds. That's what he would have been thinking about, it's what every England fan and probably a few India fans would have been thinking about when he got to 71. But unfortunately he dragged one onto his stumps and it was no more than India deserved, they bowled brilliantly today. The way he played shows he's not a man who has completely lost his game or his will to succeed so everything he did today, he'll have to do again second time around. There may be another guard of honour, it'll be a place full of emotion. Hopefully it doesn't happen on a quiet Monday when there's no one in, hopefully it happens on Sunday. He's got an opportunity but he's never wanted this Test match to be about him, he'll be thinking about the team as he always has done and trying to win a Test match. Fair play to Moeen as well, he's trying to show everyone he's a No 3 and when you're at your best it's very easy to just go out there, Moeen's such a fluent player. But sometimes you judge people when they're not at their best, he's blatantly wasn't at his best today but he stuck around. It's the oldest cliché in cricket: you can't get any runs back in the dressing room. Moeen stayed out there for a long time, he had a lot of luck against the three Indian seamers, who have been quite brilliant, I have to say, for the whole series. They don't deserve to lose this series 4-1, they don't deserve to lose it full stop, there have been another couple of dropped catches but Mohammed Shami, Ishant Sharma and Jasprit Bumrah have been exceptional. Meanwhile, out of all the dismissals this summer, the one today will have frustrated Keaton Jennings the most. He's had some jaffas, some unplayable deliveries like that ball from Bumrah in the last Test. But with the man round there at leg slip, just to poke it round the corner… it was very tame. It's something that England have done though, I did a Third Man on the TV and I think it is 12 times now that England have been caught at leg slip in the past two years. They're going to have to look at it with where they're going this winter. Rangana Herath bowling into the rough in Sri Lanka and with all the Sri Lankan spinners, they'll have men round the corner and Keaton will be very disappointed with the manner of that dismissal this morning. Joe Root went without scoring and he has changed a little bit. We've looked at some stats and before 2016 he was averaging over 100 to balls that were straight but since 2016 he's averaging 18 or 19, he's been getting out bowled and lbw. He definitely fell over the one today. He's gone onto off stump with Bumrah, which is understandable, but now that the bowler has seen him go onto off stump it has meant he is falling over the crease just a little bit and is susceptible to the big inswinger. Fair play to Bumrah, early on in Root's innings, he got it absolutely spot on. I don't think it is something England fans should worry about too much, it's just a case of Root working at his game again. It's part of being an international cricketer, you change, people change with you and then you have to readdress what you're trying to do. Root's not looked at his fluent best this summer, let's be honest, but you can't be at your best all the time. Watch day two of the fifth Test between England and India from 10am, Saturday on Sky Sports Cricket.